Origin and Habitat: Bolson de Mapimi (a.k.a. Comarca Lagunera), Durango, center-north of the Mexican Plateau. Altitude: 1000-1200 m above sea level. Habitat: The Bolson de Mapimi is a semi-desert plateau generally low and flat, closed at the bottom and surrounded on all sides by mountain slopes and covered for part of the year by lagoons, which during the rainy season overflow through the rivers Nazas and Aguanaval. The bottom of such lagoons are typically occupied by unvegetated shallow salt lakes or salt pans. The lowest area of a bolson is called the playa, and the lakes that form there are known as playa lakes. Although some playa lakes are nearly permanent, most are ephemeral. 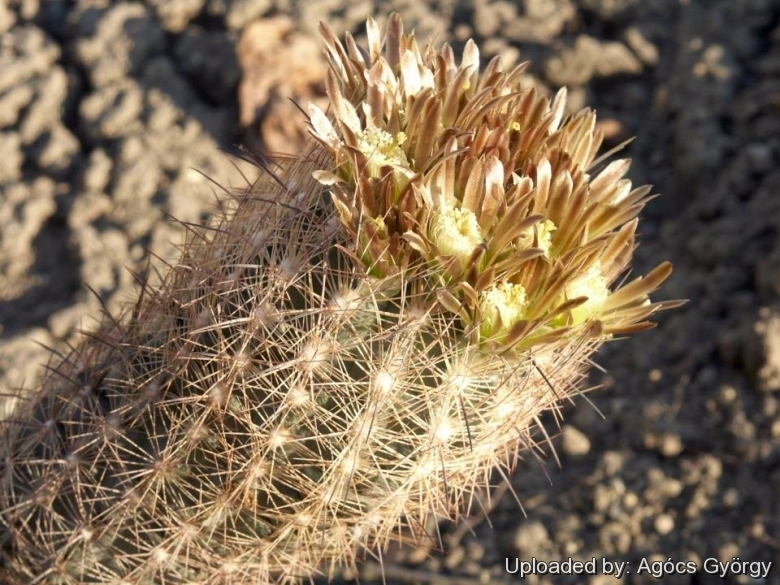 Vegetation is usually restricted to low gravelly hills in typical chihuahuan desert formations. 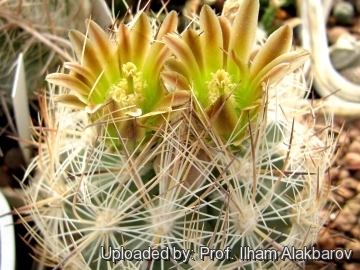 This area is particularly rich of succulent endemisms such as: Coryphantha valida, Coryphantha poselgeriana, Coryphantha macromeris, Coryphantha kraciki, Coryphantha difficilis, Corynopuntia grahami, Epithelantha micromeris, Echinomastus durangensis, Echinomastus mapimiensis, Echinocereus stramineus, Glandulicactus uncinatus, Ibervillea sonorae, Mammillaria lasiacantha, Mammillaria grusoni, Mammillaria gasseriana, Mammillaria pottsii, Peniocereus greggii, Thelocactus bicolor, Ariocarpus fissuratus v. lloydyi etc. 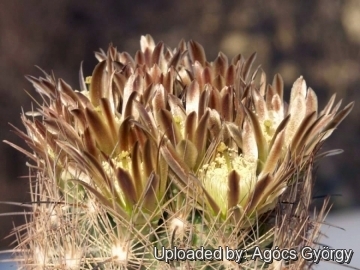 Echinocactus unguispinus Engelm. in Wisliz. 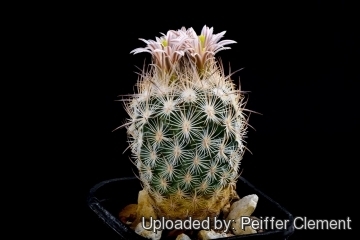 Description: Plants solitary with spines almost hiding the body. Stem: globose to short cylindrical 8-11 cm tall, 7-9 cm in diameter, gray-green or bluish green. Radial spines: White to yellowish brown to blue-gray with black apex, becoming gray with age,15-30 mm long irregularly spreading, some interlacing. Central spines: Stronger, 3-6, white to brownish but occasianally black, the upper side is always darker than the bottom side, straight to curved,15-20 mm long, directed upwards, lower one pointing outward and downward. 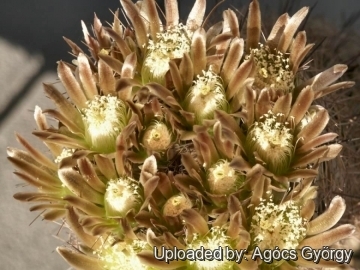 Flowers: Funnelform, dirty brownish red or yellowish- brown, up to 2.5 cm in diameter. Echinomastus mapimiensis Backeb. : Its habit is very similar to that of E. unguispinus v. durangensis, with longer and thicker central spines. Echinomastus unguispinus (Engelm.) Britton & Rose: has whitish to dark, lower central spine pointing outward and downward, 15–35 mm long. Distribution: Chihuahua, Coahuila, Durango, Zacatecas, and San Luis Potosi. Echinomastus unguispinus subs. durangensis (C.Runge) U.Guzmán: is a little smoller, with more slender, much finer and lighter-colored spines, none of them strongly recurved. Distribution: Zacatecas and Durango, Mexico. 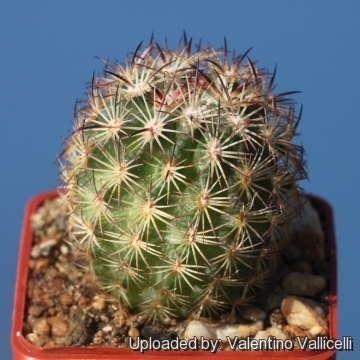 Echinomastus unguispinus subs. laui (G.Frank & Zecher) Glass: has stronger and longer central spines and occupies the southernmost regione of the distribution range of the species. Distribution: Salinas, San Luis Potosi. 4) Gómez-Hinostrosa, C. & Hernández, H.M. 2013. 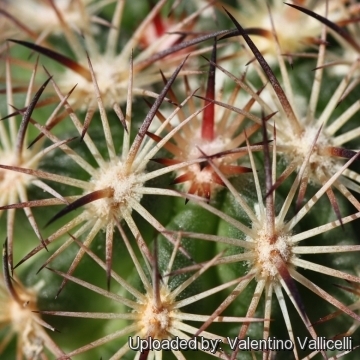 Sclerocactus unguispinus. In: IUCN 2013. "IUCN Red List of Threatened Species." Version 2013.2. <www.iucnredlist.org>. Downloaded on 06 April 2014. 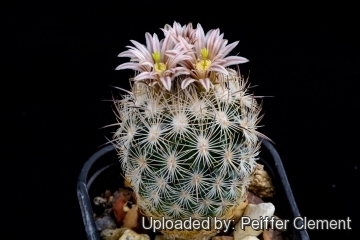 Cultivation and Propagation: This is one of the most beautiful cacti but rarely seen in cultivation, it needs perfect drainage to flourish. It is quite difficult to grow on its own roots. Very easily rot! It’s thought that’s better to watch this species in photo or in the natural habitat rather than to try to cultivate it. For this reasons the plant is often grafted on a frost hardy stock. Soil: Give an open soil that drains fast, and avoid mixtures containing peat or any other form of sphagnum moss. Exposure: This plant need full sun and above all a very good ventilation, especially in winter. Water requirements: Keep totally dry during winter, and in summertime make sure that the soil dries enough between waterings. It can tolerate temperature below zero (-5° C or less). Remarks: Mature individuals - if the growing conditions are not optimal, easily rot and die. Propagation: Seeds are relatively difficult to germinate (only a limited percentage of seeds germinate). Moreover it is easy for the seed to get lost behind the spines, which are stiff enough that when you try to retrieve them you just might loose them altogether. Grafting is often used to speed growth rate and to create a back-up for plants in collection.